There are many types of mounted bearing units available which are made up of a housing with a bearing mounted inside. Some of the common types of mounted bearing units include: pillow block bearings, flange bearing units and take-up bearing units. Most mounted bearing units feature a single-row ball bearing with an extended inner ring that is mounted in a pillow block or flanged housing. Two-bolt and four-bolt designs are the most common designs for flange mounted bearing units with miniature two-bolt flanges known as flangettes. 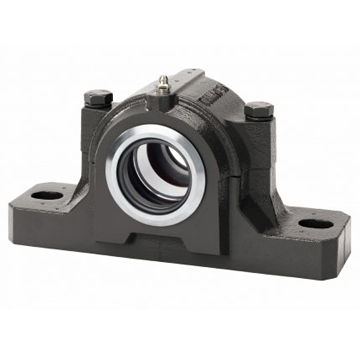 Pillow block bearing units are also known as plumber block bearings and are designed to accommodate radial loads in the direction of the support surface. Other units that have the shaft running parallel to the mounting surface include take-up bearing units and tapped-base pillow blocks. Our wide range of mounted bearing units is available with a full choice of locking styles and housing designs as well as different types of seals for all types of environments. The spherical mounting means that the units can handle an initial misalignment of up to 2 degrees giving a very versatile tolerance. For our complete range of mounted bearing units and to speak with our expert team just give us a call today on 01256 761067 and we’ll be happy to help.